Who in their right mind would spend their time thinking about Padmé Amidala’s funeral with some many other awesomely cool Star Warsie things happening??? It’s a rhetorical question — I would spend the time thinking about it. Sure, this is probably not the most exciting or in-depth post you will ever read from me, but sometimes there are moments when something in the Star Wars universe just keeps pestering me and I can’t get it out of my head. This is one of those moments. I have been thinking about Padmé’s funeral a lot, lately, and decide I had to share the love. PLUS, to make things even more exciting, the latest issue of the Darth Vader comic (which came out this week) has an incredibly direct reference to the funeral. In fact, it serves as one of the major plot points in the issue. All I can surmise is that this was a sign from the universe that I was supposed to write about Padmé’s funeral this week, especially since I bought the comic AFTER I had written half of this post. Crazy! Padme’s funeral procession passes through the streets of Theed. Of course, before this reference in the 10th issue of Darth Vader, the only canonical reference to Padmé’s funeral was the 45ish seconds at the end of Revenge of the Sith. 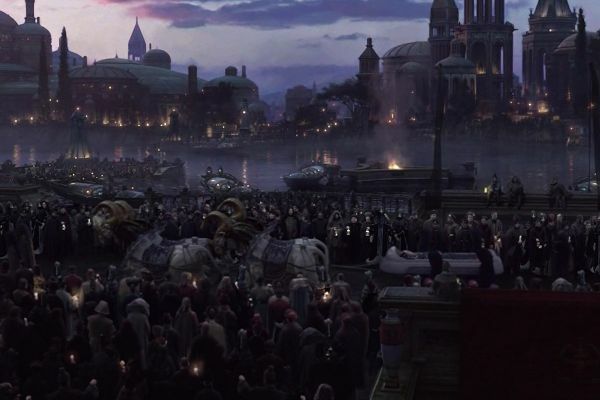 In the scene, Padmé’s body is transported through the streets of Theed as thousands of onlookers pay their respect. Here is a link so you can re-watch it for yourself: Funeral Procession. Now, I could sit here and come up with something intelligent to say about the nuances of a royal funeral on Naboo, especially now that Darth Vader provides a little more insight. But I am no expert in the conduction of funerals, and I would rather not try to sound smarter than I really am. Really, the most I could say is that Padmé’s body is most likely heading from the funeral ceremony to its final resting place. Nor am I interested in over-explaining the somber feel of the scene – after all, it is a funeral procession so of course it is somber! You hardly need me to explain why all the people and aliens in the scene look so sad. So what the heck do I want to talk about? Answer: The little girl who appears in the procession for all of two seconds. 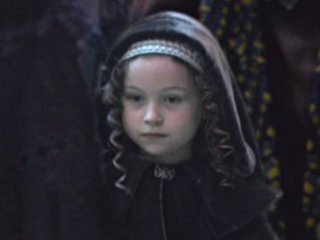 For the longest time after watching Revenge of the Sith, I was oddly fascinated with the little girl who appears in the funeral procession. Honestly, I just couldn’t figure out who she was or why she was even in the funeral procession. This also means that for the longest time I forgot I could just look up the credits of the film. Long story short, she is Padmé’s niece, Pooja Naberrie, and was portrayed by Hayley Mooy. If nothing else, you just learned a fun piece of Star Wars trivia. You’re welcome! Pooja and her older sister Ryoo (who you can also briefly but barely see in the procession), along with their mother/Padmé’s sister Sola, were originally slated to appear in Attack of the Clones. However, their scenes were cut in the final edits (you should check out the deleted scenes from the film if you get a chance). In what would have been an opportunity for audiences and Anakin alike to meet Padmé’s family, including her parents, the meeting just doesn’t happen. Like I said, I have always been fascinated by Pooja’s two-second appearance. Of course, knowing that she is Padmé’s niece gives her screen-time some justification. She is family and is mourning her aunt so what more is there to really say about her? Well, like I said, Padmé’s funeral, and Pooja’s inclusion in the procession, have been pestering me lately. For some reason, my brain just couldn’t drop it. Why is Pooja so important? What about her, besides her relationship to Padmé, makes her so damn interesting? Oh wait, Pooja and her sister are Luke and Leia’s cousins. Wait, Luke and Leia have cousins!?! What the hell!?!? Are they all going to meet at some point!?!?! Leia viewing the portrait of one of Naboo’s former queens, Padme Amidala. I have no idea if, by the end of Return of the Jedi, Padmé’s parents or sister would still be alive, but it is entirely likely that Pooja and her sister would be. And here is the thing: it is only a matter of time until the story is written where Luke and Leia learn about Padmé. 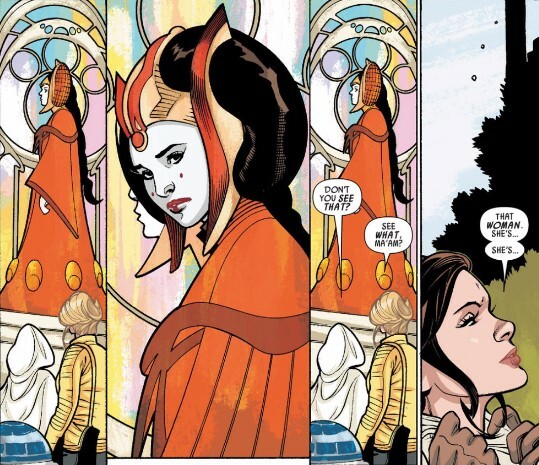 Heck, in the Princess Leia comic, Leia even stops to reflect on a stained glass portrait of Padmé when she travels to Naboo, having no idea who this woman actually is! Eventually the the twins are going to discover who their mother was, so why not let Pooja be the one to break the news to them? Personally, I think this wouldn’t just be a cool way of approaching the revelation, but it would essentially build new meaning into Pooja’s very brief on-screen appearance. No longer would she just be an obscure little girl walking in a funeral procession. Instead, we would see her in a new light, knowing that this child will one day reveal the truth to Luke and Leia about who their real mother was. As her niece, Pooja could provide insight about Padmé that the twins could otherwise not gather from a non-familial source. Plus, in what would be the ultimate connection to her on-screen appearance, Pooja would be able to share details about being at the funeral, explaining that Padmé was so loved that the streets were packed with mourners, human and Gungan alike, who came to pay their respect. Like I said, eventually Luke and Leia WILL discover who their mother was, and they will want to learn more about her, so just let Pooja have the honors. Honestly, it would be a damn shame if she just continues to be the obscure little girl who shows up for a couple seconds at the end of Revenge of the Sith. Besides, I think Pooja could end up being a very cool female character in the post-Return of the Jedi era. But I will leave that thought for another post. Haha thanks good sir! Appreciate the positive feedback. And yes, you DO need to get caught up on the reading…which I am sure you have by the time you read this reply. Hi, just browsing…I did want to let you know that Anakin did in fact meet Padme’s parents. It is an deleted clip in Ep 2 and its in the books as well. As in non-canon material, Pooja talks about meeting Anakin (after he and padme got married and returned home after the clone wars started). She mentions how she was scared of his mechanical hand (he didn’t wear a glove back then) and how after many years after the battle of Endor, Leia confronted her about them being cousins as they had already been good friends since both of them served as senators in the Imperial Senate together and were allies. Pooja had only found out that Padme and Anakin were married as the Monk who married him told her. Anyways, just thought you should know. Thanks for the comment! Indeed, I was aware of those appearances. I was always sad that we didn’t get those deleted scenes in Attack of the Clones, but understandable since filmmakers always film more than is necessary. With the shift to the new canon, I hope they are able to find ways to re-incorporate Pooja, and the rest of Padme’s family, into stories in the future. And would it not be cool that Padme’s niece, Pooja, was the mother of Rey. How romantic. That’d be a neat little way for Rey to be related to Luke and Leia without it needing to be so direct. I still think Rey is going to be related with Luke, cause she looks a lot like Padme. I’m with ya, I still think she will be related to Luke. But, I also think it possible that she isn’t related to anyone we know, and she is a “nobody” in the sense that her parents weren’t really anyone special. Maybe Sola (Padme’s sister) is still alive, but I doubt that her parents are still alive, since of how old they might’ve been in Revenge of the Sith.